This year is the first we've been able to go hear the Megillah (Book of Esther) read on Purim in a long time. Purim is a really fun holiday, with lots of sweets, costumes, boisterous behavior and even a little drinking on occasion. When we lived in Kentucky, it was just too far to drive to Nashville to celebrate this holiday/party with our congregation. (70 miles each way makes it a long journey, even for a fun event.) So, we especially enjoyed ourselves this year--with a knitting twist. This year's holiday got a jump start when I got a sweet phone call from an editor the week before we moved from Kentucky to Winnipeg. It was July, it was hot, and the house was pretty much disassembled when this kind editor asked me if I'd contribute something to her publication. 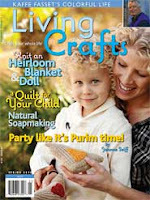 While I couldn't manage it before moving, I did eventually design these very simple knitted hamantaschen noisemakers and wrote an article for Living Crafts Magazine. I found out recently they made the cover! Last week, the professor and I got asked if we could help out with a project. A volunteer group in town was preparing Mishloach Manot for some of the less fortunate in the Jewish community. We went along to help and I got one of the best jobs--rolling out dough for the hamantaschen. The dough is a tricky business--too soft and it's too mushy to mold into a three cornered cookie. Too much flour and it's too hard and it tastes pretty much like a rock when you're done baking. However, I was sort of worn out from all that dough rolling and didn't make any more treats to hand out...in fact, we've rarely ever had a chance to give out treats for this holiday, since we weren't near enough to a community who did this or understood the tradition. When we got to the synagogue last night, we were surprised to receive 3 bags of treats of our own! We'll have to do better next year so we have treats to hand out to our new friends here in Winnipeg. Meanwhile, we've been doing further work to get our house in order. (no, we still aren't entirely tidied up even though it's been 7 months...) The professor surprised me today. He'd been in the basement organizing. He assembled a shelf and made himself a gorgeous little work area. I took a photo because it may never be this neat again! Right beside the new workbench, we've got another project going. Many Winnipeggers like to do "home brew." This is in part because the winters are long and the alcohol tax here is high! (many wines are twice the cost of what we paid in the US.) The biology professors even have a wine tasting competition each fall to see whose is best. So, the professor bought a wine kit and started our first batch in January. Here is our little basement "cave." The first batch of Sauvignon Blanc was "mise en bouteille" February 27th, 2010. I'm hoping that is a good vintage at our house....especially since two more wine kits are lined up! The light is streaming in the windows today...it's been a quiet and sunny day. It made me reflect on how lucky I feel to enjoy our house with its big windows with good positions to enjoy wintertime sun. We're still working out the fireplace issues. O ne detail? The insurance on the house would go up 20-25% if we were to install a woodstove or woodbox insert fireplace--a much higher incidence of house fires from this, so that option is out. We'll keep working on this to find a good solution. I'm still grateful to have this house..it was hard to find. In the meanwhile, hope you're having a sunny warm day and a Happy Purim if you celebrate it! Once upon a time, some newcomers to Winipeg had a lovely old house, built in 1914. Said house needed a lot of tender loving care. It had some things that worked splendidly. It had some things that done broke a darn long time ago. We have a chimney. It is your average chimney for our neighbor hood. It has corbelling but not too much corbelling. (Yes, this was a word I've learned since moving here. It's in the dictionary...) It was built in a sturdy way, back in 1914. However, we now have a chimney where the bricks just rest gently on each other, touching intimately. No mortar between the bricks. At all. This is complicated by the fact that we have these lovely original cast-iron coal burning inserts in the fireplaces. Two small fireplaces. Gorgeous. Limestone in the living room, and brick in the professor's study. Totally impractical for today's world. No, we do not burn coal. We do not burn anything, because if we did, we'd burn down the house...cause remember, no safe chimney, shallow fireplace, etc. We've been doing research on how to fix all this. The options are ridiculously varied. Take down chimney. Rebuild chimney. Get a woodburning insert/woodstove/gas fireplace insert/gas logs/gas stove/etc. Put decorative flowers in there, put a note on the mantel that says NO FIRES and call it a day... All suggestions people have offered us. Some things will not work. For instance, new gas fireplace inserts will not fit in our fireplaces, so we've had more than one person suggest they just cut up the masonry surrounds (from 1914) to make those new things fit. Does. Not. Sound. Safe....or historically respectful. Have I mentioned that all of the above options will cost something between $9,000 and 15,000 to come up with a solution? Oh, and that if we don't fix that dang chimney this spring, it's likely to just fall off the roof and kill a passerby in a stiff wind?! Now, if the above scenario causes you hyperventilation problems like it bothers me (and believe me, this is just one of the interesting problems we've encountered this year, between new/old house, immigration, work, etc. ), you might need to calm yourself. Quick. Look at this spindle. Breathe. Think peaceful thoughts. It doesn't replace the one I loved that snapped in my bags while travelling to write Fiber Gathering. However, it's a nice spindle, and if you look at that webpage? I have pretty much every variety of spindle he makes. I especially like the Turkish and Bedouin spindles. The kind that broke, a "hi-lo" spindle, is one I think he might no longer make. I do miss it. I also have been weaving to "beat" the band. Or at least, beating the heck out of these roving rugs I've been learning to do. Here are a couple of pictures of my efforts. I've done 2 twill rugs, one plain and one striped. I've done 2 plain weave rugs, one plain and one striped. All the rugs are roughly 2 by 3 feet, with the striped plain weave one maybe a few inches longer. The wools used are Icelandic, Romney and Cotswold. The warp is cotton. First, these snow sculptures have little or nothing to do with this post. It's just that I don't have any photos to go with what I'm writing, and it would be a shame to waste such fascinating and ephemeral art! My favorite sculpture was the one of the parasols. It was so elegant and I've no idea how the artist kept it all aloft. The temperatures here have been just a little below freezing (-4C was the high, so in the 20's F) so I'm glad we saw the sculptures at the beginning of Festival! The ones around town are beginning to look a bit less crisp around the edges--droopy even. One of the less glamorous details about moving to Manitoba has been dealing with immigration. We've met U.S. citizens who moved before the days of increased security...and apparently, it never used to be very difficult to move here. Either that...or they've all blocked it out. Most people apply for permanent residency before they move to this province. In our case, we had to wait until the professor was officially approved for his job. Then, we had to rush everything to get packed and moved in time. We were granted work permits, and so we're facing the complications of applying for residency while living here. There are many stages. We filled out paperwork listing everywhere we'd lived since age 18. (a lot of places.) We made copies of all sorts of official documents. The professor had meetings with the appropriate university official who goes through the details. On Friday, we went to the downtown police department--for fingerprinting. For us, this was sort of a fun adventure. It was snowing some, and we navigated ourselves through rush hour and got a parking space directly in front of the building. (After all, who wants to visit the police department first thing? Us!) The fingerprints are sent to the FBI. They check to see if we're upstanding citizens. In fact, if the powers that be warrant it as a secondary check, they can ask us to do this for every single state we've lived in since we were 18. For the professor, that's 3 states, for me, it's 4, and the professor did a graduate degree abroad, so that's... (never mind.) For 2 sets of fingerprints each, it was $110 Canadian. You can imagine, the costs add up. I think we entertained the police clerk as we weren't in any trouble, and I even had previous experience being fingerprinted! I worked briefly during college for the U.S. Justice Department, so I'd been fingerprinted and even had a lie detector test at the FBI in Washington, D.C. once before. The bureaucracy of all this is actually logical. There's no mystery to it, it's spelled out and clear. It is apparently harder to move to Ontario (a heavily populated province) than it is to move to Manitoba. We've been assured that as long as we are good souls, this isn't a lottery and we'll be welcomed to the province officially as permanent residents. Although it costs a fair bit, from what we hear, it doesn't cost as much as it costs to move to the U.S. This whole process has made us aware of how hard it is for immigrants and refugees who move to North America every year. We're lucky. We speak English, we read English, and we're mostly capable of understanding how things work in this culture. We're educated, and we got to move here with warm winter coats and boots. We got to bring all our belongings, our cars and our dogs. We weren't escaping danger or hardship. So, while the hoops we're jumping seem to take up a lot of time, we realize it's no worse and probably a lot easier for us than for many other immigrants we've met. In fact, when we compare it to our families' immigration stories, (dated anywhere from 1840 to 1950) who took boats to the U.S. and landed without a lot of English, well, we have it pretty ok.
We also now realize that the average person (Canadian or U.S. citizen, or whatever) doesn't have a good idea of what this is like. We're often asked if "We're all settled in now..." and we wonder whether to just say, "yes thanks" or explain what's really happening. The other immigrants just smile and nod knowingly and ask what we're up to in the process. Each day we live here, we learn something new. Some days, we learn two things...On Friday, I learned 10 important details. When I had my fingerprints done by the FBI, I seem to remember that the ink was permanent and I scrubbed like crazy to get it off. In Canada, at the Manitoba police station, the ink isn't permanent. They have a solvent nearby. That ink comes right off. See? No one knew that I got fingerprinted on Friday unless I told them. That's definitely an improvement on last time. Did you learn something new today? Do tell....seems like every day around here is a chance to learn new vocabulary, customs, or about fingerprinting ink! Then I walked my dogs, which is a normal daily activity. Then....the professor and I went to Festival du Voyageur. Festival (with a French pronounciation of fest-ee-vaaal!) is a chance to learn about Manitoba's fur traders, Western French Canadians and the culture of the early Red River Colony. It's also a chance to have fun outside, see amazing snow sculpture, hear fun music and eat fair food. It was a bright sunny day and very crowded. Here's the line to get into the reproduction of Ft. Gibraltar. We parked very far away and walked a long while to get to the line. I was very sore the next day from skating, walking and tromping through snow and wished I'd brought my snow shoes! Then we went to see my friend Carol, whose beautiful weavings are featured at the festival. These traditional sashes are handspun and woven very tightly. The commercial yarns Carol uses all have to be "respun" to make them stronger before weaving--the original use for "energized singles!" The fur traders used these sashes to carry hundreds of pounds of fur on their backs as they travelled long distances. They are also very pretty! Carol weaves the sashes in a variety of ways. Some are done on a loom, and some are done with finger weaving or sprang. Her sashes are in big demand in the province. After saying hello to Carol, we sampled some bison jerky and even some bannock cooked on a campfire outside. We visited a tipi and the fort museum. We heard live music from loud speakers, but didn't manage to settle down in one of the tents to listen for any length of time. There was so much to see! We finished off our visit with some hot mini doughnuts coated in cinnamon and sugar. We limited ourselves to 15, but we could have bought an entire bucket...and they even offered bucket refills! While that seemed decadent and unhealthy, we could see the temptation of hot fried sweet food that boosts the energy of people who spent all day outdoors working in the cold. We admired all the snow sculptures (there were lots) and then took the long trudge back to the car. I ended the day with a hot bath and woke up with sore muscles, but it was worth it! This post may be a bit quirky. I am feeling a bit wobbly--had some bad allergies/asthma earlier today. Due to the nice medicines I took, I can now breathe well. (Hurray!) However, I am feeling a bit disconnected from my toes. Off-kilter. :) Most of the day's activities were shelved so that I could sit quietly and avoid any missteps! The first big news is only what you might expect from the daughter of an automotive engineer. When I got my big floor loom, I was thrilled by it and threw myself into weaving. What I didn't love was the horrible squeals that happened when I put my foot on the treadles to lift harnesses. I asked around, and my friends said there weren't many places to oil on a loom and --don't those metal heddles sound noisy? Well, when something squeaks that much, it turns out that there are moving parts and places to oil and yes, those heddles are noisy--but it wasn't the heddles. I started out with sewing machine/spinning wheel oil, but I just couldn't seem to eradicate the noise. Finally, the professor came back from the hardware store with this spray lubricant guaranteed not to stain or harm wood, metal and plastic. I used that spray can stuff so much yesterday that I thought the smell alone might be dangerous in a closed up room in winter! All of a sudden...I hit it. The squeal-ly places. Silence. The squeaks were gone. Wow. In fact, it was so quiet today that the professor didn't even realize I'd been weaving. Hurray! My family in Northern Virginia are all snowed in with an enormous blizzard. (My mom's had a lot of time to knit!) There's been a flurry of emails back and forth about it, as they are all completely snowed in. In fact, there was a period where some of them didn't even have electricity. I'm relieved to say that everyone's fine (and the electricity's back on) but they seem to be getting a little bored when it comes to shovelling and staying indoors. After 3 feet (90cm) of snowfall in a week, one could get tired of shovelling! Here in Winnipeg, we get our snow just a little at a time, but it never melts in the winter. So, I thought I'd post som e photos of what some winter landscapes here are. This here on the right is my front walk. If you make the photo bigger you can see Harry and Sally's paw prints--we always leave the house from the front door for our walks. A packed snow path is standard in our neighborhood; it mostly provides traction without ice. I find the elms that line our street beautiful in all seasons so far. They are these majestic and enormous skeletons in the snow. They also can help figure out where the sidewalk is as compared to the street itself! I met these guys from the city out surveying the street the other day. They had to use pick axes and shovels to find the curbs and sidewalks underneath the snow! I asked them why they didn't just use Google Earth instead, and one of the younge r guys smirked. Apparently they looked up the street that way first, before putting on their parkas and coming out to survey the old fashioned way! Harry loves to play dress up, so we thought this might work better for him. First I tried putting on one or two booties. He walked around like he was drunk and his paws stuck in molasses. Then, I hoisted him onto my lap. He lolled around like a big furry baby. I put all four booties on him. I let him outside in the yard with Sally. At first he stood still, completely scared. Then, distracted, he forgot about his paws and took off after Sally, ready for a chase. Within 30 seconds, the booties (all four of them) flew off his feet like in a TV cartoon. Oh well. So much for booties. I had to find them all in the snowbanks and, once dried off, they still looked brand new and were returned to the store. Not all fashion styles work for all of us. I, for instance, don't wear bikinis. I'm not one for open toed pumps or nail polish. Harry and Sally? Not fans of the dog booties. Last, but not least--Icelandic seems to be the fiber theme of the day. This is my first woven rug, done out of Icelandic wool. It's about 2 feet by 3 feet. The cotton warp's a nice long one and I'm now at work on rug #2, which will be Icelandic wool as well, done in a twill pattern. So far, they're very cushy--I think they'll feel amazing underfoot. I may make longer runners of 6 feet, too. I am a fan of these very plain solid color designs--they show off natural colors of wool admirably. The next warp will likely be dark and I'll do dark brown rugs. Polka Dots Rock--Illegal downloads don't. I promised you a photo of my latest knitting--and here it is! My polka dot socks needed a little updating. The "new colors" for the green sock are Knit Picks Palette in Edamame, Green Tea Heather, and black. The pink and purple sock uses Blossom Heather, Hyacinth, and Black. The pattern is available now on my website and will soon also be available via Knit Picks website as well. I'm excited to market another pattern this way! In other news, weaving is going along well and I've completed my first 2 foot by 3 foot rug. I'm definitely still learning but am glad the professor helped me set up the warp before leaving town. I'll likely always need another person for that step. While I've made some friends here, it's still a little weird to ask a relatively new friend to come over while I bumble my way through learning to warp. It's getting easier though..and it's much less embarrassing to impose on one's partner for such things! In the last post's comments, Alison asked me how I knew that people were illegally downloading copies of Knit Green. Every so often, I do searches of my name and the names of my books on Google. It allows me to read new reviews, see who is selling the book, and even see new knitting projects posted on blogs. (I love seeing those new creations!) Sadly, now it allows me to see that people are illegally posting my book to the web so that others can download it for free. The thing is, this "sharing" denies me of my fair earnings as a result of writing my book. While I don't earn much (see what I said in that last post regarding what I probably earn per book), this movement online that makes books illegally available for free means I earn even less. Now, there are entirely legal ways of paying for and downloading an ebook if one wants to avoid the environmental impact of printing a book or shipping it. I'm very glad that's an option available for readers, don't get me wrong! Also, if someone can't afford a book, I am also very glad that both my books are available in many libraries. There have been times I've depended on the library, and I'm thrilled libraries are choosing to buy my books. However, as things stand, many people who write books these days (and publish them via traditional routes) don't do it because they will earn much or any income from it. It would be nice if I did, but so far, it doesn't look like my books will be bestsellers. In fact, I'll be lucky if I earn anything other than what I was offered at the beginning, as an advance on royalties. I did these books for a variety of reasons, but chief among them? I cared about these issues and wanted to write something for the knitting and fiber arts community. I'm posting about this here because I believe we, as knitters (and upright people) can avoid illegal downloads of books, just the way we avoid illegal downloads of music. We can choose to do the right thing. In the meanwhile, I'm relieved that traditional publishers have legal support. On Monday, I finished my first "warp" on the loom. That is, I wove until there was no more warp (threads that go north and south on the loom and in the weaving project) left. I made 5 scarves in all. Except, they could be table runners, or practice pieces, or whatever you'd like to call them. They're wool and silk, mostly plain weave, with a little twill thrown in now and again. Two of them are mostly handspun and 3 have a commercial weft and a handspun warp. Here they are, in a pile--I've got to weave in ends and tidy up these pieces before they are washed and finished. At the same time, the professor was getting ready for a big research trip to Florida. I was trying to understand how one put a warp chain (premeasured yarn or thread) onto the loom, since my first warp came directly from the last weaver's house to mine. That kind weaver also left me with 2 or 3 additional warp chains so I don't have to learn how to measure out a warp myself yet. I realized that I needed the professor's help to get the new warp on the "back beam" (the thing pictured here with the sticks on it, the sticks keep the yarns neatly wound and from sticking on each other. One person (me) to wind the back beam and keep things neat with those sticks. Second person (the professor) to hold the other end of the yarn and apply even tension. Since the professor was leaving the next day, I ended up putting on the new warp in a much less leisurely way than I'd intended. As a friend said, "I made efficient use of manpower." Now I need to put the threads through the heddles... (those metal eye like things) and that is taking time. The warp chain is old, which means the cotton yarn, wound up a long time ago, has twisted and twined around itself. The threads are not in perfect order, and I have to do a lot of straightening to get them on the loom. Still, I took my first weaving project off and got the second one on inside of a day, so I feel pretty good about that. I have some "fear of warping" left over from when I learned to weave as a kid, so I'm trying to get over it in stages! So far, so good. Otherwise, things have been less successful here, though we're trying hard. I've discovered several folks trying to offer one of my books via illegal free downloads--and my kind publisher has a very serious legal department looking into stopping that. I stand to lose something like 80 cents a book, and given the other drama below, I can't afford that! I've developed a very fine relationship with the boiler repair man after several visits. We have heat, but there's something wrong with the water pressure for the heat. It was too high and threatened to explode the radiators. Now it might be too low to actually heat the house. Despite what one wood chuck might predict, I am certain we will need heat here for February, and all of March and April too. The professor's computer died right before he left. It has apparently now been fixed, so I will try to get that for him tomorrow. Our neighbor's sewer line also had to be fixed today, so the music of the backhoe has been heard throughout the land. It's been sort of a long week and it's only Wednesday night. Oy. Please join me in hoping that the new weaving project, enabled with efficient manpower, is a sign of positive things to come! February? Bring it on.